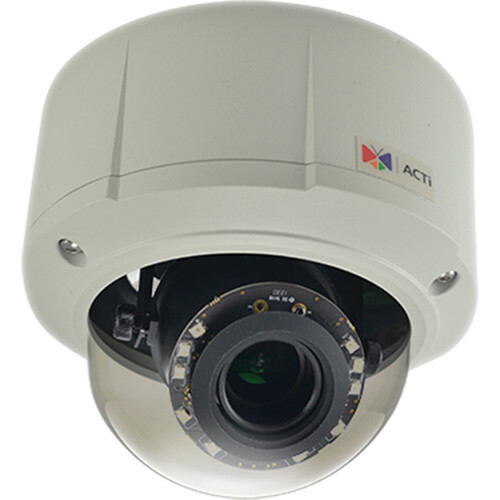 A sophisticated premium H.264 indoor/outdoor dome IP camera with zoom Varifocal lens and quality 5MP CMOS element that supports dual streams, low light conditions and event recording to SD card with FTP server upload or email. For adjusting the viewing angle, this camera offers panning and rotation of 0 to 350° and tilting of 5 to 175°. The camera uses H.264 and MJPEG video compression and outputs dual video streams. The E815 camera IR LEDs allow you to capture images in complete darkness up to 30m away by using adaptive IR technology, automatically adjusting the IR lights focus to hone in on the area that the camera zooms to. On zooming out, the LED illumination is again readjusted to cover the wider zoomed area. The camera provides superior image quality even in low illumination environments and is housed in an IP67-rated weatherproof and vandal-proof IK10-rated housing. ACTi's headquarters is in Taiwan and with over 100 models and is a powerhouse of different camera options. If you have a project, please contact us Nous House at [email protected] /* */ to put together the best mix of cameras for your site's requirements.